The deadline for the Call for Papers the 15th of December, 2011. Proposals accompanied by a paid registration, will be given scheduling priority. You will be asked to create a user account. Once this is done, you will be able to submit and modify your abstract until the deadline of abstract submission. In order to start your submission you will need to select the 'new submission' option. Abstract title: there is no word limit and contributors are asked to have comprehensive titles that will enable participants to easily select the sessions that will most interest them. Length of the abstract: 300-500 words. you might include the rational of the research, the research questions, theoretical framework, methodology, and main findings. 2. Workshop: Include the aims of the workshop and the target audience (e.g. practitioners, academics, people involved in teacher training, policy makers). Also provide a description of the intended delivery method, how you intend to involve participants and the material/equipment that will be used. 3. Panel discussion: Describe the rational of your proposed session, the main issues that will be discussed and the role that will be undertaken by each of the participants of the panel. Abstract category: Authors are expected to submit their abstract under the most appropriate category (please see description in the call). 1. Individual paper session: Each presentation will last 15 - 20 minutes followed by a short discussion. participants to interact with poster presenters. to organise 3-5 papers around a common theme for their panel discussion/symposium. Topics: you can choose one or more topics (under each category) to specify further the area of your work. Please select the topics carefully as the formation of the conference programme will largely depend on these. Please do not submit more than 2 abstracts for the whole conference. If your name is included in two abstracts, these should not be for the same topic. Authors who successfully submit an abstract will receive an automatic e-mail reply confirming receipt of the abstract. You may update or withdraw a submission until the last day of the deadline. Decisions on acceptance of the abstracts submitted will be announced by the 15th of January, 2012. Accepted abstracts by authors who are not registered as participants in the conference will automatically be removed from the scientific programme and will not be included in the book of abstracts. (When there are many co-authors, at least one of them needs to register on time). Latest deadline for registration for authors: 5th of March, 2012. Conference proceedings: Contributors who attended the conference and wish for their paper to be included in the conference proceedings will have to submit the full text, using the EasyChair system, from the 1st of April, 2012 until the 31st of July, 2012. The same deadline applies for posters, workshops and panel discussion chairs. The proceedings of the conference will be published after the conference as a record of what has been presented at the conference. No paper submission will be accepted after the set deadline. Please use APA style and formatting in your paper. Full Papers should be between 3500-5000 words. Detailed guidelines for the full paper submission will be made available on the Conference website. 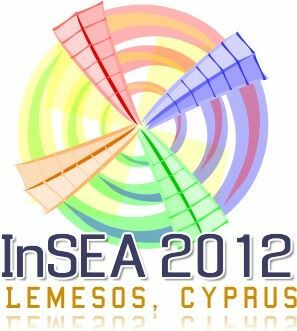 We are looking forward to seeing you in Lemesos, Cyprus, in June 2012!